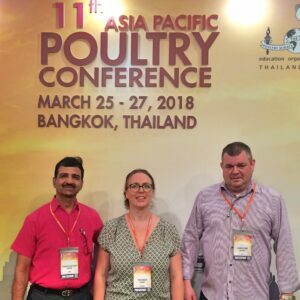 During the 11th Asia Pacific Poultry Conference, which took place in Bangkok, March 25 – 27 2018, Lallemand Animal Nutrition affirmed its position as a research-based company to advance poultry nutrition. 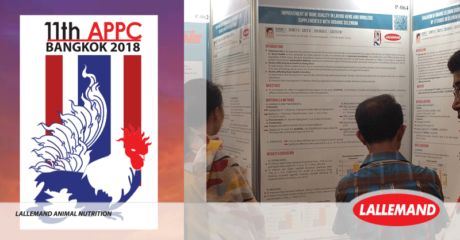 Not less than 7 scientific poster presentations featuring the company’s latest research in poultry nutrition were presented during the conference. These communications highlighted the benefits of natural antioxidants and gut microflora management utilizing probiotics and yeast derivatives. Along with the high-level content of the conference dedicated to the future of poultry farming, these communications provided further insight on how to help address hot market trends in Asia such as antibiotic reduction or food safety. Two communications at APPC showed the benefits of the probiotic strain Saccharomyces cerevisiae boulardii CNCM I-1079 in broiler chickens. In particular, its benefits in food safety applications. Saccharomyces cerevisiae boulardii CNCM I-1079 is the first and only probiotic strain authorized in the European Union (EU) as a feed additive for the reduction of carcass contamination by Salmonella spp. in broiler chickens. This is backed by a multi-analysis that was presented at the conference, compiling five studies from the scientific literature. 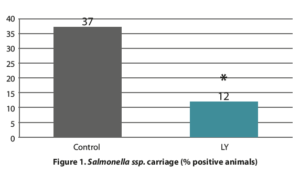 The analysis concluded to a significant reduction of the number of animals positive for Salmonella carriage with the live yeast supplement (P<0.05) and of the number of carcasses contaminated with the foodborne pathogen (P<0.05)1. The second communication confirmed the live yeast modes of action in broiler gut, which can be described as a three-ways action: enhancement of digestive microbiota, gut integrity and morphology, and immunity2. In particular, this study, conducted with Cairo University showed a significant effect of the live yeast on the activity of the bird immune organs. Oxidative stress is a significant issue of livestock farming, with impact on performance, health or reproduction. Lallemand Animal Nutrition R&D has been focusing on antioxidant nutrition in all animal species with many on-going research programs and three poultry studies were presented at APPC. In particular, a robust meta-analysis including 17 trials in laying hens with the organic selenium source ALKOSEL confirm its optimal bioavailability through egg Se enrichment4. “Maintaining high selenium status in eggs is of great importance for breeders, through the maintenance of the antioxidant system of the developing chick, but also for egg producers, since selenium-enriched eggs could be an interesting added value for the food chain. The objective of our study was to review existing information of 17 studies, performed on laying hens, partridges, pheasants, and quails, on selenium enrichment in the different egg compartments, comparing different selenium sources. The statistical meta-analysis revealed that, compared to mineral selenium sources, selenium yeast statistically increases selenium concentration in the different egg compartments (yolk, albumen, and eggshell). It does strengthen the robustness of selenium deposition in the egg compartments following selenium yeast supplementation when compared to mineral sources and further confirms its superior bioavailability”. Multi-analysis on the use of Saccharomyces cerevisiae boulardii CNCM I-1079 to reduce contamination of broiler carcasses with Salmonella ssp. Demey V. and Chevaux E. 11th Asia Pacific Poultry Conference, March 25-27, 2018, Bangkok, Thailand (Poster). Evaluation of the Efficacy of Saccharomyces cerevisiae boulardii on Performance, Intestinal Microbiota, Gut integrity and Gut morphology of Broiler Chickens in Challenging Conditions. Awaad, M. H. H., Shalash S. M. M., Atta A., Gharib H. B., Elmenawey M. A., Ali M. A., Zouelfekar S. A., Fathy F. A., Elhariry M., Samir A. and Demey V. 11th Asia Pacific Poultry Conference, March 25-27, 2018, Bangkok, Thailand (Poster). Effect of Nutrients Density and Dietary Probiotic Supplementation on Performance and Egg Traits of Laying Hens. Jankowski, J., Mikulski, D. , Mikulska, M. and Demey, V. 11th Asia Pacific Poultry Conference, March 25-27, 2018, Bangkok, Thailand (Poster). Evaluation of organic selenium source (Alkosel) bioavailability by 17 studies on selenium enrichment in eggs. Barbé F., Demey V., Sacy A., Chevaux E., Castex M. 11th Asia Pacific Poultry Conference, March 25-27, 2018, Bangkok, Thailand (Poster). Improvement of bone quality in laying hens and broilers supplemented with organic selenium. Barbé F., Demey V., Sacy A., Chevaux E., Castex M. 11th Asia Pacific Poultry Conference, March 25-27, 2018, Bangkok, Thailand (Poster). Effect of SOD-rich melon pulp concentrate and organic selenium on fertility parameters in broiler breeders. Barbé F., Demey V., Sacy A., Alleno C., Chevaux E., Castex M. 11th Asia Pacific Poultry Conference, March 25-27, 2018, Bangkok, Thailand (Poster). Coccidiosis Prevention Strategy in Broiler Chickens Using a Multi-Strains Yeast Fractions Product. Awaad M. H. H., A.A. Nada, M. A. Elmenawey, F. F. Mohamed, E. A.Morsy, H. M. Salem, A. S.Hafez, E. Chevaux and V. Demey. 11th Asia Pacific Poultry Conference, March 25-27, 2018, Bangkok, Thailand (Poster). For more information on the entire list of studies presented at APPC, do not hesitate to contact us.